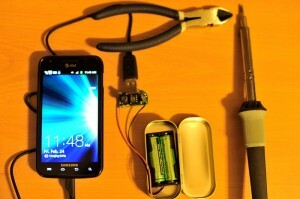 I wanted to have some extra battery power available for my new power-sucking Samsung Galaxy S II Skyrocket. But like all cell phones, this one requires its own special proprietary battery and I didn’t want to spend $25 on a specialized battery that will be obsolete in a couple years. Another issue: that expensive Lithium Ion battery cannot currently be recycled in a commercially feasible manner and is virtually certain to end up in a landfill. Solution: Minty Boost! The Minty Boost is a small charger that will charge practically any cell phone (also headphones and other small USB powered devices) using two AA batteries. The advantage is clear. If your phone’s battery starts to run out, you connect the Minty Boost just like any other USB charger. 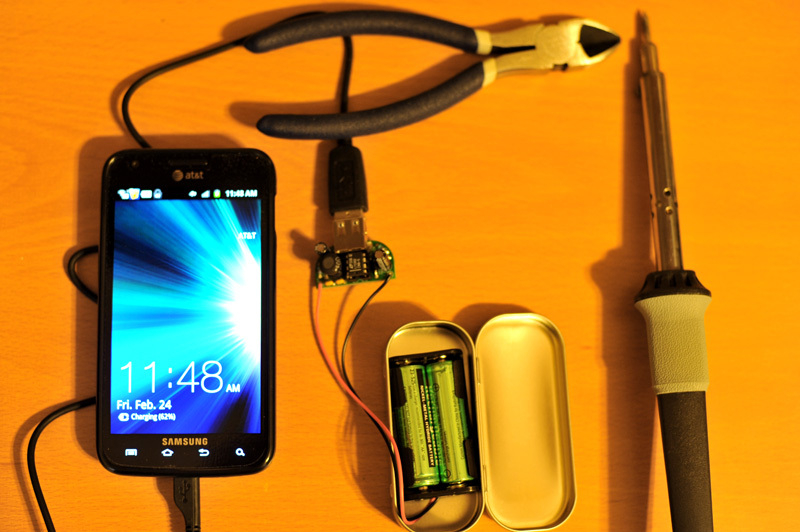 The amount of additional power you get depends on the type of AA batteries used and the phone’s requirements. With my power-mad Skyrocket, I expect about 30-50% additional charge from a fresh pair of AAs. When those run low, I can stick in a couple fresh rechargeables (if I planned ahead) or buy new ones in any drug store or convenience shop. Regular AA batteries, whether throw-away or rechargeable, can be recycled. Good rechargeables run anywhere from $8-20 for a pack of four. A good charger, like a La Crosse, will allow those batteries to provide years of service. I have some that have been used on and off for nearly 10 years that are still going strong (thanks in large part to the La Crosse’s “refresh” capability). The economics alone make this solution superior to buying the proprietary battery. When you factor in the environmental aspect, it’s a no-brainer. The Minty Boost is a kit that requires soldering and I had a blast putting it together. It took less than an hour from start to finish, not counting the container, which I still have to do. There are instructions online that are ridiculously easy to follow and include close up photos of every single step. If you have an inkling about how to solder simple components to a printed circuit board, don’t hesitate to build this project. My soldering skills are middling at best and my kit worked perfectly without any re-dos or touch-ups. One Response to Proprietary Batteries Bad, Standard Batteries Good!